Mykonos is known as the party island of Greece with beautiful beaches and crystal-clear turquoise water. June-August is prime tourist season, which means that’s when the parties are, but I went in May, and even though it wasn’t party time, Mykonos was actually my favorite stop on my trip. Here are my tips for traveling in Mykonos! There weren’t any fully vegan restaurants that I could find in the area, but these are some of the more vegan friendly/unique restaurants in Mykonos. Salads, pastas without dairy, and grilled veggies are definitely an easy way to eat vegan in Mykonos. bowl is this cute Australian cafe near Ornos beach. Imagine every cute brunch place you’ve been to with avocado toast, turmeric lattes, and açaí bowls because that’s bowl (the restaurant). They have labels for everything that’s vegan, which makes it easy to have a great vegan meal while on a break from sunbathing on the beach. On the North Side of the island exists a small restaurant on the top of a hill that faces the ocean. This restaurant always has lines out the door because of its popularity with a 1 hour waiting average, but they serve free wine and water while you wait, so that’s not bad. Kiki’s doesn’t have any electricity including in the kitchen, and they grill everything so it’s all fresh. This restaurant has a lot of seafood and meat, so it’s not for the faint of vegan hearts, but they have an amazing assortment of salads and freshly grilled vegetables that if you’re out to eat with your omnivore friends, you won’t be missing out. They offer a choice of two salads to start your meal with, and they’re all freshly prepared with a buffet to choose from. The waiter told me which salads were vegan, and then we feasted in the crispy greens. Then, feasted on some grilled eggplant (covered in loads of garlic) and grilled mushrooms. Delos is a UNESCO World Heritage Site, and this is what Delos is all about according to their website: According to Greek mythology, Apollo was born on this tiny island in the Cyclades archipelago. Apollo's sanctuary attracted pilgrims from all over Greece and Delos was a prosperous trading port. The island bears traces of the succeeding civilizations in the Aegean world, from the 3rd millennium B.C. to the palaeochristian era. The archaeological site is exceptionally extensive and rich and conveys the image of a great cosmopolitan Mediterranean port. I recommend taking a tour to Delos because of its rich history. Delos is about 30 min from Mykonos by boat and our tour package included the boat transfer and an archaeologist guide. There was a lot of history to see with limited signage, so if you don't have a guide, it's easy to miss the important facts! All those white houses by the seaside with he blue and red doors are in Mykonos Town. Mykonos Town is a pedestrian only area where you can gaze at the beautiful homes, explore local shops/restaurants, and walk around Little Venice and the windmills. It takes 20 min to walk throughout the whole little town, but there's a lot to explore and get lost in, so plan to be there a little longer (and take pictures of the windmills!). One of our favorite activities to do on the island was to rent an ATV and tour the island. All you need is a drivers license to rent one of these quads, and my boyfriend drove it with ease. Mykonos is full of hills and slopes, so I suggest renting an ATV with more engine power. The island only has ~30 taxis, so an ATV is the most fun way to get around! On the ATV, we toured the North Part of Mykonos, which is known for being less developed in terms of tourism. The beaches there are less crowded, the roads a little more bumpy, and the weather much windier than the South side. We explored the lighthouse in the North and passed by a lot of local farms. Be warned though, the North Side is much windier than the South, but it's nice to feel the wind through my helmet protected hair. The South side of the island has a stretch of beaches, but unfortunately they are not within walking distance from one another, so we took the ATV to explore the stretch of gold sand. 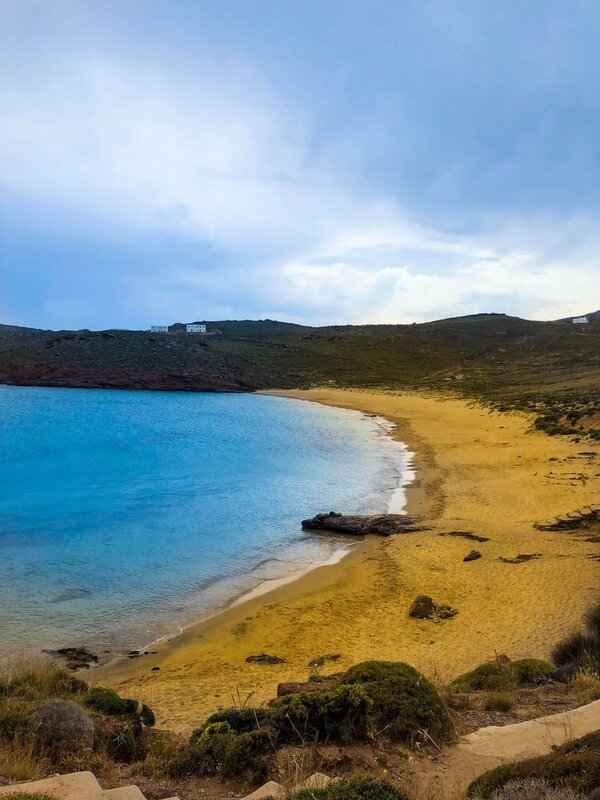 We explored Ornos beach because it was the closest to our hotel. If you’re looking for party beaches, Paradise Beach and Super Paradise beach are known to be the top party beaches on the island. Those two beaches operate like a nightclub with EDM blaring and a waitress taking your drink orders as soon as you take a seat on the beach. Many of these beaches have chairs and umbrellas you can rent for a day. However, if you bring your own towel, you can lay down wherever you want. The water was cold, since we went in May, but it was still beautiful to gaze at as you sunbathe. I stayed at the Grand Mykonos hotel, which my boyfriend said was the perfect hotel for our stay (and he’s picky!). The hotel room I stayed in was super cute, with a balcony that let in a lot of natural light, and had a view of the private beach. There are other rooms that have a private pool, so if you feel like treating yourself, that’s definitely an experience. You don’t need a private pool though because there’s a huge heated pool that faces the ocean on the property (and a private beach). Some other perks about the hotel was the buffet breakfast, with tons of fresh fruit and veggie options. They also have a collection of recent DVDs for movie nights in bed (I saw 300 and My Big Greek Fat Wedding for the first time...very timely, I know), a nightly shuttle that takes you to Mykonos Town, and a gym (we actually tried jogging on the island, but there are no sidewalks, so it was a little challenging). I really just enjoyed being in the beautiful space, letting in all the vacation vibes.